Every four years a presidential election allows us to take stock of the state of the nation – where the country stands on issues, its demographic shifts, and its cultural views. 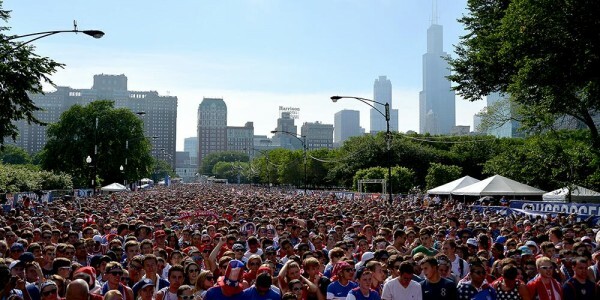 The World Cup does the same for same; it allows us to take stock of the state of the American soccer nation. So what did we learn about U.S. soccer after Brazil? On the field, the team looked a lot like the ones before, but the we now have a better foundation for which to build due to MLS. Off the field, we turned a real corner off the field, and shocked the world with the level of our support. The 2010 Team was better, but that doesn’t mean we aren’t progressing. When looking to judge the progress of American soccer, we usually ask is this team better than the last? But in many ways this last cycle was going to be one of transition. We changed coaches a year in and our two best attacking players Donovan and Dempsey were now over 30. Not only were Donovan and Dempsey both in their prime in 2010, but often forgotten about the 2010 cycle was that three massive injuries devastated the squad prior to the tournament. In September 2010, Charlie Davies almost died, Oguchi Onyewu the next day tore his ACL, and Stuart Holden got DeJunged with a broken leg right after moving to Bolton in a March friendly. It is safe to say that if those injuries didn’t happen those three players would have been among our best 10 outfield players. Holden and Onyewu still made the 23 man roster but clearly weren’t ready. With those three players a starting 11 of Altidore and Davies, Dempsey and Donovan wide, Holden and Bradley in midfield, and a Bocanegra-Onyewu-Demerit-Cherundolo (the back line that anchored the 09 Confederations Cup) would have been formidable. Instead, our depth was challenged and Bradley had to tinker to find replacements. This cycle we were actually quite fortunate with injuries until the Great Hamstring Outbreak struck during the tournament (…not to mention Klinsmann’s own-goal of leaving Donovan behind). But based on the collection of players it is fairly apparent that the quality in the 2014 cycle just was not quite as good as the 2010 cycle. …But that doesn’t mean we aren’t progressing. While the 2010 squad was probably better, it was also heavily Euro-based. This is why we can feel pretty good about the progression of American soccer. This team was an MLS based team. Against Germany seven of our starters played in MLS and showed throughout the tournament that they were in the same class as their opposition. That players like Matt Besler, Omar Gonzalez, and Kyle Beckerman showed so well on the world stage after playing their whole careers in MLS is something that should make us optimistic about the future, as MLS has shown it can produce quality players. This doesn’t mean players shouldn’t still look to challenge themselves in better leagues. But for many, like Kyle Beckerman, that opportunity may just never materialize. Yet Beckerman’s career shows that you don’t have to leave MLS to develop and to be a key cog in the UMNT. That’s very very good news for US soccer. With the progress in MLS, we can now expect going forward to have a much deeper USMNT player pool, which should help ensure that we are always competitive. In other words, the ceiling for the 2010 team may have been higher than 2014, but the floor was also probably lower. Due to MLS, the floor for the USMNT is now much higher than it was. We still don’t know who our next Donovan or Dempsey is? Each cycle has seemingly produced our next break out attacking player – McBride in 98, Donovan in 02, Dempsey in 06, Jozy in 10. This World Cup didn’t have that clear next guy. Yes Fabian Johnson and DeAndre Yedlin had a break out tournaments, but you don’t build your attack around the right back. Jozy’s injury in this tournament was really unfortunate, and at 24 he could still be to this decade what Donovan was to the last. But no one new this cycle emerged as the next attacking heir apparent. In fact, the attacking MLS-only players all underperformed – Graham Zusi, Brad Davis, and Chris Wondolowski. While MLS is providing depth (and quality defenders/midfielders), perhaps it isn’t yet at the quality to refine attacking talent. This shows us that becoming elite will take time. 12 years ago when Donovan emerged we assumed we all assumed that we would be producing 23 different Landon Donovans by now. We aren’t yet, and that’s partly because we underestimated how elite Landon Donovan really was/is. But also because becoming a soccer power wasn’t built in a day. However, identifying more dynamic attacking players has to be a priority for Klinsmann in the coming cycle. The progress off the field is the big story of the World Cup. Soccer really captivated the nation for an entire month. The support was so immense that it is not an overstatement to say it shocked the world. I would argue was one of the global stories of the World Cup. Through this World Cup, the sport was finally able to shake the old and tired claims of critiques and cranks who described the sport as un-American, or boring, or foreign. Yes Ann Coulter got a lot of attention, and a few sports reporters dismissed the whole event, but in this case she was shouted down by the masses, not by the soccer diehards. The progress off the field, matters for future progress on it. Not only will the next generation of players have heroes to aspire to, but the massive crowds had a defining characteristic: they were full of young millennials. There is a huge generational divide in support and interest in soccer and the massive crowds of young people will definitely perk the interest of advertisers. Expect a lot more money flowing into sport over the next four years, which will help the sport develop. Additionally, foreign clubs will be tripping over themselves to promote their clubs in the US. And the best way to do that is to buy American players. Expect to see more European clubs looking to swoop up American players over this next cycle.